Now that we are a few month into 2014 it’s important for us to look at the trends which are emerging for this year and which will help us to progress further in the tech industry. There are many ideas and notions which are breaking out in 2014; Companies are planning to adapt many of these to their workflow and infrastructure to work more smoothly and efficiently. In today’s article we will discuss the top 6 trends of 2014 that businesses should adopt for better productivity and cost savings. Virgin Group’s Chairman Richard Branson writes: Technology is helping every business, large and small, to move forwards, which will only increase in the coming year, however this year will be for the entrepreneurs as predicted by the tech gurus. But if we talk about IT and digital technology one thing is going to be developed more like past year i.e. BYOD and Cloud technologies. The mobility in work even while in a move will also be appreciated for this coming year. Mobile devices are going to become more prevalent across all organizations. With the BYOD and Cloud Computing enterprises will look for the options where they can make this work seamlessly and with complete security. Until now company information / data security and user authorization / authentications were the issue causing the most concern, but companies are planning to make these devices and infrastructure more secure by implementing policies and procedures to help maintain a separation of work and personal usage.. The Internet is expanding beyond PCs and mobile devices world into enterprise assets such as field equipment, and consumer items such as cars and televisions, etc. The problem is that most enterprises and technology vendors have yet to explore the possibilities of an expanded Internet and are not operationally or organizationally ready. So, it’s been predicted in the coming year that the internet in general, as well as its usage and development will grow at a faster pace than in prior years. With the personal and external private clouds becoming more manageable for organization of all sizes, there is a growing acceptance of this technology. In this, enterprises should design private cloud services with a hybrid future in mind and make sure future integration/interoperability is possible. Hybrid cloud services can be controlled in many ways, like varying from relatively static to very dynamic. Terms like “overdrafting” and “cloudbursting” are frequently used to describe what hybrid cloud computing will make possible. However, the majority of hybrid cloud services will initially be much less dynamic than that. Also popular is the Personal Cloud, which is a cloud focusing solely on the a single users devices (e.g., cell phone, tablet, personal computer) and the associated data storage / backup. With companies coming up with devices which can be used as your personal assistant which are intelligent enough to make many work related tasks easier through automation or smarter interfaces. These new devices will be quite attractive to individual users and companies. Devices like smart watches can control your mobile devices and make it possible for you to schedule task without even taking out the mobile device from your pocket. Such powerful machines are definitely going to make an impact in coming year. Gartner believes that individuals will invest in, control and use their own smart machines to become more successful. Enterprises will similarly invest in these smart machines. A software-defined infrastructure is all about decoupling the hardware that implements the data transactions from the software layer that creates them. Rather than discrete elements like compute, storage, and networking, infrastructure will be treated as a set of resources required for specific workloads. The goal is about using software to create an underlying infrastructure that can be managed virtually as part of the business. In 2014 we will see organizations finally implement software-defined architectures to achieve continued flexibility and control of many of their traditional IT functions. 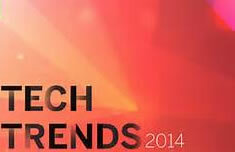 The above are just a few of the trends for this coming year, based on the technologies that were made available in 2013. Given the rate of change and advancement in hardware, software, services and applications, it’s entirely possible a completely new innovation will arrive in the coming months. One just never knows when a company or individual could come up with an innovation or with a completely new idea which prompts an industry changing event. Source: GoArticles by Author Larry Adson, co-written with the help of a web app development company that expertise in custom web and mobile app development.